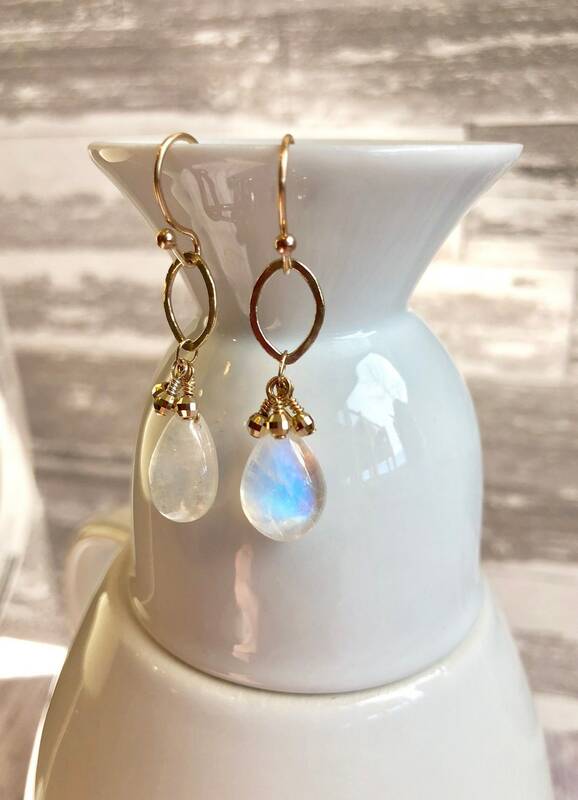 A larger rainbow moonstone gem is the finishing touch to this solid 14 karat gold lever back earring. This gem is super tricky to photograph, but it definitely has a lovely bluish fire that appears as the light catches it. It is smooth to the touch and mesmerizing. Beautiful detailed gold beads dangle down front he solid gold link to give this earring extra sparkle and texture. Solid gold lever backs keep your ears comfortable and your earring secure. 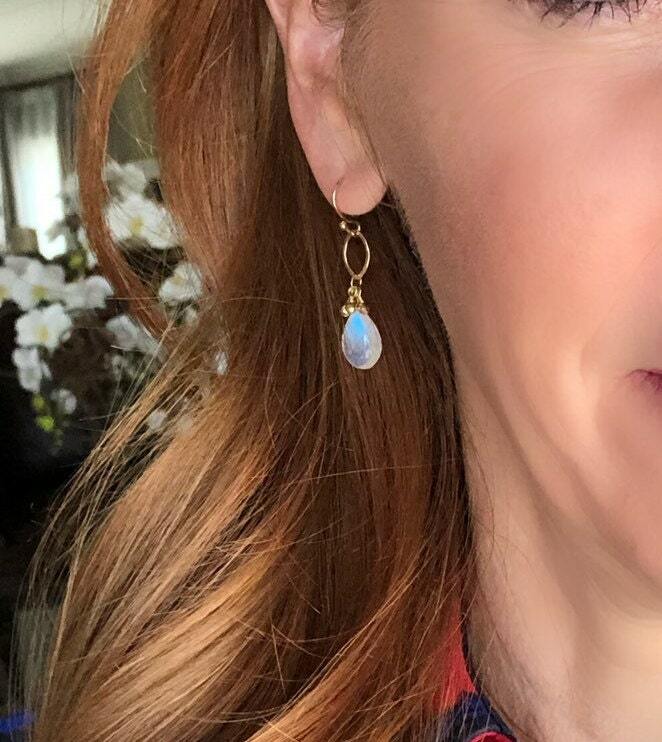 The length of this earring, not including the ear wire, is 27 mm. 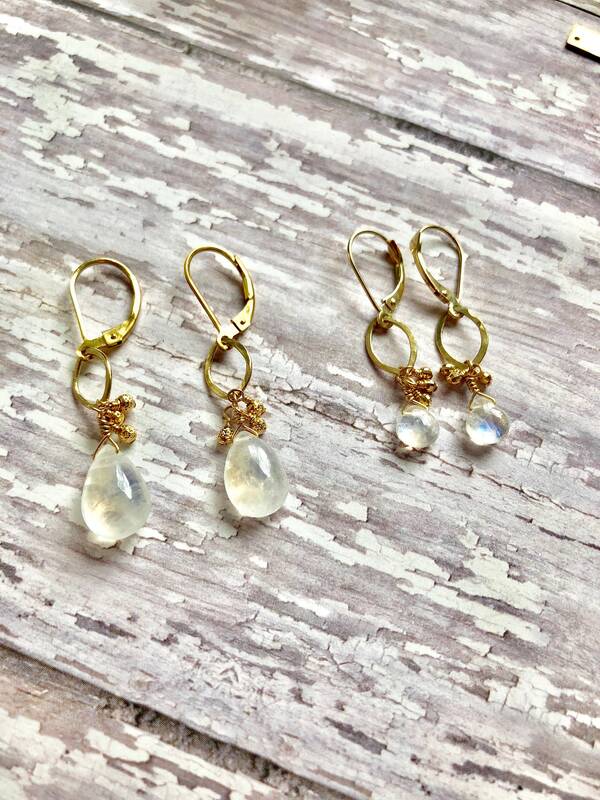 The picture on the left is to compare it to my smaller rainbow moonstone earrings also available in my etsy store. We accept payment through PayPal and credit cards through Etsy. Items will not be processed/shipped until payment is made. If payment is not made within 48 hours of confirming the purchase, we will cancel the order. Please understand we do not have control over the USPS. For United States orders that ship via USPS, tracking information is provided. We ship to the exact address you have provided at check-out so please double-check that you have provided the correct shipping address. Once your order has shipped, WE ARE NOT RESPONSIBLE FOR LOST OR STOLEN PACKAGES. Please track your package on https://www.usps.com/ and/or consult your local USPS Post Office for items that were undelivered. Jewelry orders for in-stock items will be shipped out within 2-4 business days. Made to order items typically take about 3-5 business days per item. Custom orders can take up to 4 weeks to complete depending on the order. Please allow enough time to complete your custom order. 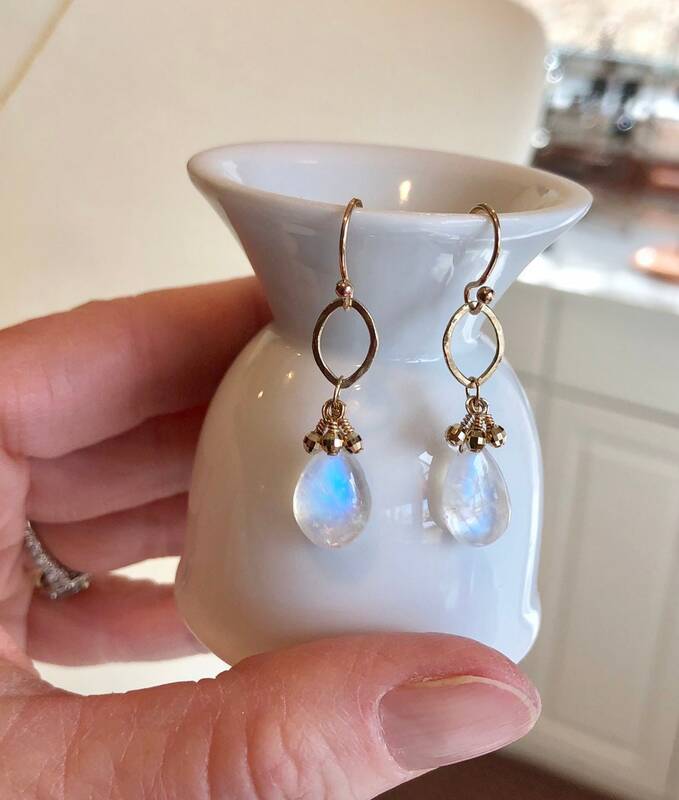 Remember that each item is handmade (each pearl/gemstone is individually wire-wrapped) and we may have to order components that are not in stock for your special order. Rush orders are possible but may incur an added fee. We charge $3.00 for the first item and $.50 for every additional item. Orders over $150 will be shipped free. All shipping is done through the United States Postal Service (USPS), unless requested otherwise. Shipping insurance is NOT included in the shipping cost. If you prefer shipping insurance, please contact us to discuss extra fees for insurance. This is highly recommended for high ticket pieces. If, in the unlikely condition, you are unsatisfied with your order once it is received, please contact us within 7 days of delivery and we will be glad to help you with your return. The buyer is responsible for the shipping charges. Please do not wear a jewelry piece if you intend to return it to us. For hygiene reasons, earrings must be unworn.Thank you for understanding. If the item is damaged when you receive it, contact us and we will fix it. We strive to make quality pieces that last. Customers cover the cost of shipping to our shop for exchanges. We do our absolute best to portray accurate colors in our photos, yet every computer screen is different. 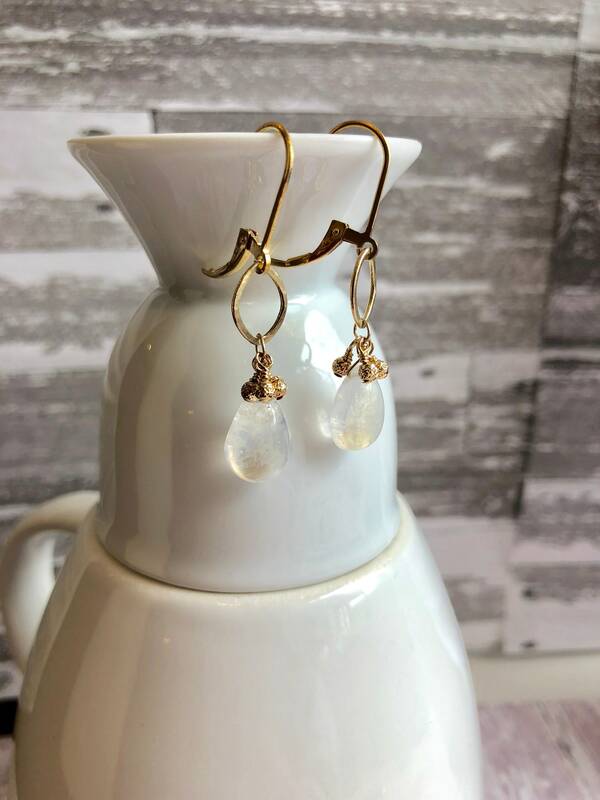 For stones, please understand that these come from natural elements, so you may notice slight variations in each stone, and no two stones will be exactly alike. We use sterling silver (99.2% pure silver), Thai silver (99.8% pure silver) and gold fill (14Kt gold over sterling silver) in all our jewelry unless otherwise stated. Most people with allergies to silver are allergic to the other 7.5% metals added to silver to give it strength (like nickel, copper, germanium). In our experience, most people find no allergic reactions to Thai and Bali silver because of their higher silver content. But you know your skin and body the best, so you will make the best decision. We are happy to answer any other questions about materials used. 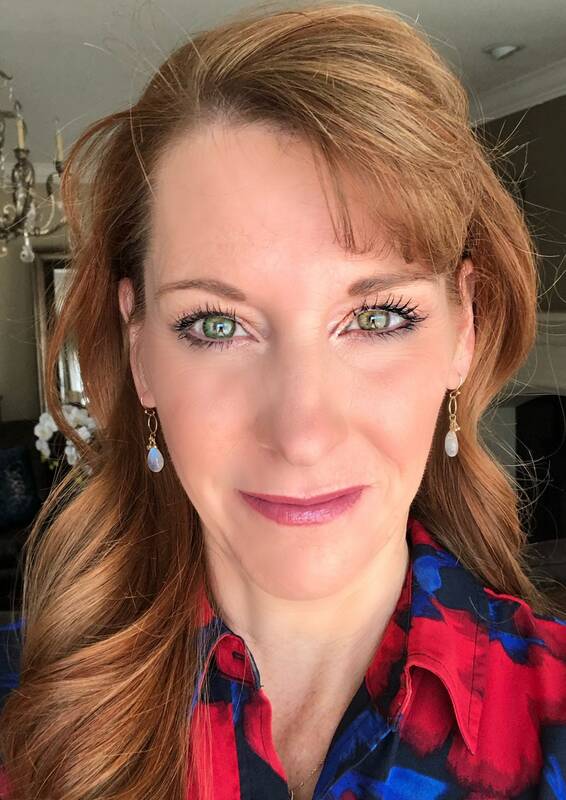 Is the jewelry Sterling Silver? We use solid silver findings and materials for our jewelry. We pride ourselves in using the good stuff. Our gold is gold-filled metal, which is 14 Kt gold over sterling silver. Solid gold is available on request, but it will incur an added fee. Avoid storing your jewelry in humid places--like your bathroom. If you don't plan to wear a certain piece for a while, store it in a plastic bag to keep the air and humidity out. Use an organic jewelry paste with a soft toothbrush, your fingers and a little warm water. We carry a professional silver paste cleaner for only $10. Throw your more sturdy pieces in an old sock, knot it and toss in the washing machine! Don't use this on fine pearls,opals, leather pieces or delicate pieces. I know it sounds crazy, but it works like a charm! If you have questions about this method, please contact us. Do not spray perfume or hairspray on your jewelry. This also goes for lotions and make-ups. Your gems should be the last thing you put on before you walk out the door. Do not wear in a swimming pool or hot tub. Chlorine can damage various gemstones and metals. Keep away from chemicals, extreme temperatures, and sunlight.